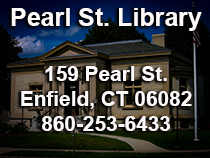 Friends of the Enfield Library support library activities, raise much needed funds through book sales and other events to purchase new materials for the library. The group has grown to a membership of over 150. 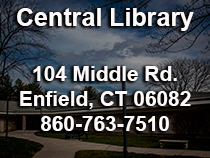 You are invited to become a member of the Friends of the Enfield Library for as little as $10 per year. With your membership you will receive admission to the "preview" book sale, advance notice of events and lots more. To join pick up a membership form at the library. The Friends of the Enfield Library hold their yearly book sale the first weekend in June. Your membership also entitles you to take part in the Annual Friends Dinner held each May in the Community Room of the library. The Friends of the Enfield Library help us to bring in widely known authors like Malachy McCourt, Jane Yolen, Donna Stewart Hardway and Steve Hamilton. The Friends of the Enfield Library meet monthly on the last Tuesday of every month in the Community Room of the library. At some of those meetings throughout the year local authors talk about their works and offer signed copies. Members also visit the Friends of the Enfield Library work area on Tuesday evenings throughout the year to sort books for the annual book sale. If you are interested in becoming a sorter either join in, or call to schedule yourself to sort at another time. Explore the world beyond the library through museum passes provided through the generosity of the Friends of the Enfield Library Museum Pass Program.